Celiac disease (CD) is caused by gluten ingestion in susceptible individuals. Tissue transglutaminase (tTG)-specific Abs are characteristic of CD, and increased tTG activity has been observed in the jejunal biopsies of patients. Here we demonstrate that tTG selectively deamidates gluten peptides, which results in strongly enhanced T cell-stimulatory activity. To our knowledge, this is the first example of an enzymatic modification of a food protein that affects T cell recognition. Moreover, these modifications may lead to the amplification of gluten-specific T cell responses in the gut and consequently may be important for the development of CD. Celiac disease (CD)3 is a common malabsorption syndrome that is precipitated upon exposure to the dietary wheat gluten or its active component gliadin (1). The occurrence of the disease is strongly associated with HLA-DQ2 (2, 3), while most DQ2-negative patients express the DQ8 molecule (4). Gliadin-specific DQ2- and DQ8-restricted T cells have been found at the site of the lesion in the gut (5, 23). Taken together, these findings suggest that the intestinal damage in CD is caused by aberrant mucosal T cell recognition of gliadin-derived peptides in the context of disease-associated DQ2 and DQ8 molecules. Next to the T cell response against gliadin, IgA Abs against gliadin and endomysium are specific indicators of the disease (6, 7). Recently, tissue transglutaminase (tTG) has been identified as the autoantigen for antiendomysium Abs (8). tTG belongs to a family of calcium-dependent enzymes that catalyzes the cross-linking of proteins by introducing a covalent bond between lysine (K) and glutamine (Q) residues (9). Whereas several K-containing proteins can serve as acceptor substrates, only a limited number of Q-containing donor substrates exist. Since mucosal tTG activity is increased in CD patients (10), and since gliadin is a preferred substrate of the enzyme (10), it has been speculated that tTG might be important in the generation of gliadin-gliadin or gliadin-tTG complexes, giving rise to novel antigenic epitopes (8). The putative formation of gliadin-tTG complexes could explain the appearance of antiendomysium Abs upon gliadin exposure in vivo and in vitro (11) as has been suggested previously (12). The association of CD with DQ2 and DQ8 is indicative of the preferential mucosal recognition of gliadin fragments bound to these DQ alleles (13). However, gliadin-derived peptides display only a low affinity for DQ molecules (14). The peptide-binding motifs of both DQ2 (15, 16, 17) and DQ8 (18, 19) indicate a preference for negatively charged residues at several positions of DQ-bound peptides. Interestingly, because of the large proportion of Q residues in gliadin (≤40%), the conversion of Q to E (glutamic acid) residues by deamidation would result in relatively large numbers of negatively charged E residues in gliadin. Since tTG is capable of the deamidation of Q residues (20), we have now examined whether tTG might increase the mucosal T cell response against a gliadin digest and a previously identified, DQ8-restricted, gliadin-derived epitope (23). A pepsin/trypsin digest of gliadin (Fluka, Buchs, Switzerland) was prepared as described previously (23). Peptides were synthesized by standard 9-fluorenylmethoxycarbonyl chemistry on a multiple peptide synthesizer (Abimed AMS 422; Abimed, Langenfeld, Germany). The isolation of the gliadin-specific HLA-DQ8-restricted T cell clone (TCC) S2 from a small intestine biopsy of patient S (HLA-DQ2/8 heterozygous) has been described previously (23). Gluten-specific TCCs of a biopsy of patients P (HLA-DQ2/8 heterozygous) and Po (HLA-DQ2/6 heterozygous) were established in a similar fashion, with the exception that autologous PBMCs were used as APCs instead of IL-4/granulocyte-macrophage CSF-cultured monocytes. TCC S2, TCC P1, and TCC Po27 are all CD3+, CD4+, TCRαβ+. 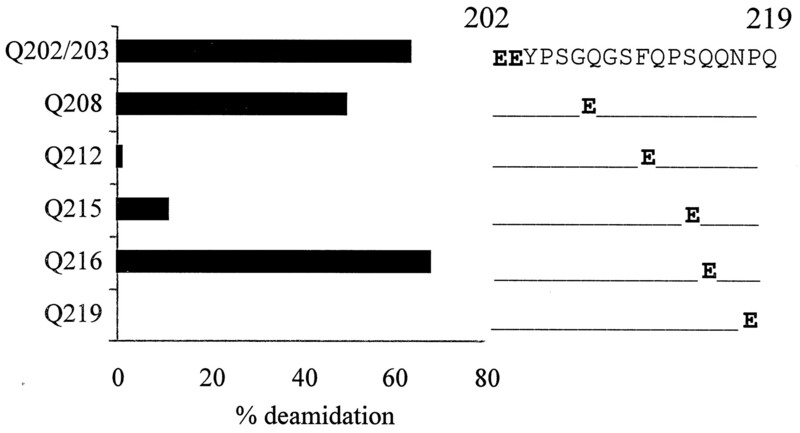 The pepsin/trypsin-digested gliadin and the gliadin 202–219 peptide (at concentrations of 500 and 250 μg/ml, respectively) were incubated with 100 μg/ml of guinea pig tTG (T-5398; Sigma, St. Louis, MO) at 37°C for 2 h in PBS with 1 mM CaCl2 and subsequently used in T cell proliferation assays. Proliferation assays were performed in duplicate or triplicate in 150 μl of culture medium in 96-well flat-bottom plates (Becton Dickinson, Lincoln Park, NJ) using 104 T cells that had been stimulated with 105 irradiated (3000 rad) HLA-DQ-matched PBMCs in the absence or presence of Ag at the indicated concentrations. The cultures were pulsed with 0.5 μCi of [3H]thymidine after 48 h and were harvested 18 h thereafter. Electrospray ionization mass spectrometry was performed using a hybrid quadrupole-time of flight (TOF) mass spectrometer, the Q-TOF (Micromass, Manchester, U.K.), as described previously (23). Briefly, precursors were selected with the quadrupole, and fragments were collected with high efficiency with the orthogonal TOF mass spectrometer. Argon was applied as the collision gas (pressure was 4 × 10−5 mbar), and the collision voltage was ∼30 V.
Previously we have identified a peptide derived from gliadin that is specifically recognized by an HLA-DQ8-restricted TCC (TCC S2) that was isolated from the small bowel of a patient suffering from CD (23). The minimal core region of the T cell-stimulatory gliadin 198–232 fragment was defined as residues 206–217 (sequence SGQGSFQPSQQN of gda09; SwissProt accession number P18573). We and others (17, 21) have suggested that the conversion of Q to E (deamidation) potentially increases the antigenicity of gliadin-derived peptides. To test this hypothesis, substitution analogues of the gliadin 206–217 epitope, in which individual Q residues were replaced by an E, were tested for their T cell-stimulatory capacity. The Q212 → E and Q215 → E substitutions completely abolished the proliferation of TCC S2 (Fig. 1⇓). T cell reactivity toward the Q208 → E and Q216 → E analogues, however, was strongly increased compared with the wild-type (wt) peptide: 100-fold less of these substituted peptides were required for the induction of half-maximal T cell reactivity compared with the wt peptide (Fig. 1⇓). A similar effect was observed for a substitution analogue in which both Q208 and Q216 were replaced with E (Fig. 1⇓). Q208 → E and Q216 → E substitutions increase the antigenicity of the gliadin 206–217 peptide. A total of 104 T cells of TCC S2 were tested against a concentration range of the indicated peptides in the presence of 105 irradiated (3000 rad) PBMCs from an HLA-DQ2/DQ8-positive donor as APCs. Amino acids are shown as single-letter codes. Values show the mean cpm (× 10−3) of triplicate cultures. The SD was <10%. At least two mechanisms could cause the deamidation of gliadin in the gastrointestinal tract: acid-induced deamidation during passage of the stomach and enzyme-mediated deamidation. We have been unable to find evidence for deamidation after treating the gliadin peptide with gastric juice for 3 h at 37°C, mimicking the in vivo circumstances in the stomach (data not shown). Also, no increase in T cell-stimulatory properties of this peptide was found (data not shown). Next, we investigated whether enzyme-mediated deamidation might result in the enhancement of gliadin-specific T cell recognition. CD is associated with high tTG activity (10). Moreover, gliadin is a preferred substrate for this enzyme (10). Therefore, we determined the effects of tTG treatment on T cell recognition. To this end, the gliadin digest and an 18-mer peptide of the gliadin epitope (residues 202–219) were treated with tTG and subsequently tested for their T cell-stimulatory capacity. 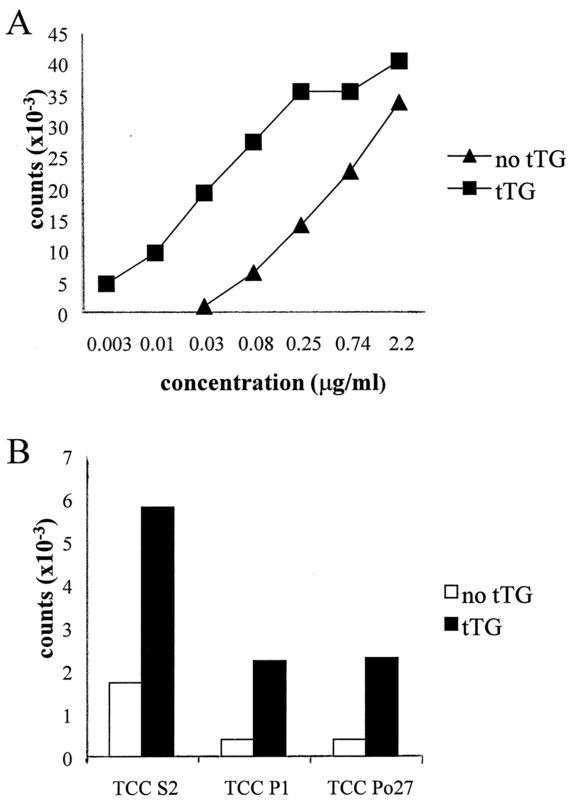 The observed T cell responses against a concentration range of the gliadin preparation and the peptide demonstrated a clear increase in the antigenicity of the Ag due to the tTG treatment (Fig. 2⇓). Similarly, tTG treatment of the gliadin digest enhanced the reactivity of a gliadin-specific DQ8-restricted TCC (TCC P1) and a gliadin-specific DQ2-restricted TCC (TCC Po27) that had been derived from other CD patients (Fig. 2⇓B). The peptide specificity of these latter two TCCs is not known. tTG-treatment of the gliadin 202–219 peptide (QQYPSGQGSFQPSQQNPQ) (A) and the gliadin digest (B) promotes T cell recognition. A, a total of 104 T cells of TCC S2 were tested against a concentration range of the tTG-treated (▪) and untreated (▴) gliadin 202–219 peptide in the presence of 105 irradiated (3000 rad) PBMCs from an HLA-DQ2/DQ8-positive donor as APCs. B, a total of 104 T cells of the DQ8-restricted TCCs S2 and P1 and 104 T cells of the DQ2-restricted TCC Po27 were tested against tTG-treated and untreated gliadin digest (at a concentration of 10 μg/ml) in the presence of 105 irradiated (3000 rad) PBMCs from HLA-matched donors as APCs. Considering the gram-amounts of gluten that are ingested in a normal diet per day, the concentrations used in these experiments may very well occur at a certain timepoint in the small intestine. No tTG-specific T cell responses were found (data not shown). Values show the mean cpm (× 10−3) of duplicate cultures. T cell responses in the absence of gliadin were <150 cpm. The SD was <10%. Next, we determined the number and location of potentially modified residues in the gliadin 202–219 peptide upon tTG treatment. For this purpose, the peptide was subjected to tandem mass spectral analyses. Such an analysis yields a peptide fragmentation pattern that contains information on the nature and order of the amino acids in the peptide. A comparison of the fragmentation patterns of the tTG-treated and untreated peptide revealed a shift of 1 Da at Q202/203, Q208, Q215, and Q216 (data not shown); the shift corresponded to the conversion of Q to E at these positions in the peptide. No significant shifts were observed at any other position in the peptide, including the Q residues at positions 212 and 219 (data not shown). The highest percentage of deamidation was found for Q202/203 and Q216: ∼70% of these residues were converted into E, whereas the tTG treatment resulted in 50% deamidation of Q208 and 11% of Q215 (Fig. 3⇓). Thus, tTG treatment selectively deamidates Q residues in the gliadin 202–219 peptide. In the core of the peptide, the most dramatic deamidation occurred at Q208 and Q216 (see Discussion). Selective deamidation of Q residues in gliadin peptide 202–219. The percentages of deamidation of the individual Q residues in the gliadin 202–219 peptide were calculated on the basis of the mass shifts observed in the fragmentation patterns as obtained by tandem mass spectrometry. An average overall mass shift of ∼2 Da was found for the tTG-treated peptide (data not shown). The mass profiles did not allow discrimination between the conversion of a Q to E at either position 202 or 203, so % deamidation at Q202/Q203 is shown collectively. The residues at positions 208 and 216 constitute the p1 and p9 anchors (see Discussion). It has been well-established that CD is caused by gliadin ingestion in susceptible individuals. The presence of a T cell infiltrate at the site of the lesion in the gut is characteristic of the disease. Whereas the T cell response is directed against gliadin, IgA Abs to endomysium correlate well with disease (6, 7). Recently, tTG was identified as the autoantigen that is recognized by these antiendomysium Abs (8). Although such Abs are not likely to play a direct role in the pathogenesis of CD (22), the increased tTG activity in the jejunal biopsies of patients together with the finding that gliadin is a preferred substrate of the enzyme (10) suggest that tTG might be involved in the disease process in some way. We now report that tTG increases mucosal gliadin-specific T cell recognition by the selective deamidation of Q residues. Whereas the most established property of tTG is to catalyze the cross-linking of proteins via the formation of isopeptide bonds between Q and K residues (9), it is also known that tTG can deamidate Q residues in the absence of K residues (20). The mass spectral analyses of the tTG-treated gliadin peptide indeed revealed deamidation, but of particular Q residues only. Both DQ2 (15, 16, 17) and DQ8 (18, 19) prefer negatively charged residues at particular anchor positions of the DQ-bound peptide. We observed that particular Q to E substitutions in the gliadin core peptide abolished rather than promoted T cell recognition (Fig. 1⇑). Strikingly, minimal or no deamidation of these residues was seen with tTG. In contrast, the two Q residues in the core of the gliadin peptide that are most affected by tTG (at positions 208 and 216) constitute the p1 and p9 anchors on the basis of the DQ8 peptide-binding motif (18, 19) and molecular modeling studies (data not shown). It is predicted that the conversion of these residues to E will result in peptides with a higher affinity for DQ8. Modeling studies also indicated that the Q215 residue points up toward the TCR. Therefore, the deleterious effect of the Q215 → E substitution is best explained by a direct effect on T cell recognition. In view of the preference of DQ2 for negatively charged residues at relative positions 4, 6, and 7 in the bound peptide (15, 16, 17), it is likely that tTG can also promote DQ2-restricted T cell activation. Indeed, tTG treatment of the gliadin digest was also found to enhance the response of two other gliadin-specific TCCs, one of which is restricted via the disease-associated DQ2 molecule. Thus, enzymatic deamidation may modify multiple gliadin-derived T cell-stimulatory epitopes simultaneously. This observation suggests that tTG-mediated deamidation may have a profound effect on polyclonal gliadin-specific T cell reactivity in vitro as well as in vivo. However, the identification of additional gliadin-derived T cell epitopes and of the effect of tTG on these epitopes is required in support of this possibility. The gliadin peptide used in the present study was originally defined as a 35-mer gliadin fragment containing pepsin-cleavage sites at both ends of the peptide (23). Taken together with the present data, this finding suggests that the gliadin fragment is first generated by pepsin cleavage in the stomach and is followed by tTG-mediated deamidation in the mucosa of the small intestine, resulting in a potent stimulatory peptide for lamina propria T cells. Although it is unclear at present whether the T cells have initially been activated by the wt gliadin fragment or the deamidated version, one could envisage that the wt peptide is responsible for the initial trigger of T cell activation. The accompanying tissue damage would result in the release of tTG. This release, in turn, may lead to the generation of more potent T cell-stimulatory peptides that would amplify the disease process. Future experiments may shed light on this issue. In conclusion, this study demonstrates that enzymatic deamidation by tTG enhances gliadin-specific T cell activation in vitro. The results support the hypothesis that the mucosal presentation of (modified) gliadin-derived peptides is the mechanism underlying the association of CD with DQ2 and DQ8 and suggest that enzymatic deamidation may amplify the disease process. Which other currently unknown gliadin-derived peptides are similarly modified remains to be determined and will to a large extent depend upon the sequence specificity of tTG, which will be the subject of future research. We thank Drs. J. van Bergen, H. S. de Koster, and R. Jordens for helpful discussions. Drs. J. W. Drijfhout and W. B. Benckhuijsen are acknowledged for peptide synthesis. ↵1 This study was supported by the Dutch Organization for Scientific Research (NWO) (project no. 900-509-171), the European Community (project no. B104-CT95-0263), and by a “RUL stimuleringsfondssubsidie”. ↵3 Abbreviations used in this paper: CD, celiac disease; tTG, tissue transglutaminase; TCC, T cell clone; wt, wild-type; TOF, time of flight. Van de Wal, Y., Y. M. C. Kooy, P. van Veelen, A. S. Peña, M. L. Mearin, Ø. Molberg, K. E. A. Lundin, L. M. Sollid, T. Mutis, W. B. Benckhuijsen, J. W. Drijfhout, and F. Koning. 1998. Small intestinal T cells of coeliac disease patients recognize a natural pepsin fragment of gliadin. Proc. Natl. Acad. Sci. USA. In press.